Summer is coming to the end! With that comes the autumn leaves and cool brisk mornings. I am going to be drinking coffee on my deck while watching the autumn sunrises. Besides the mowing and raking of said leaves, I love this time of year. Here in Nebraska we live and die with Nebraska football. So September comes, and so does football season. The weather starts to cool off, and my desire for wings and ice cold brews becomes irresistible. There is a local restaurant here that has wings that they fry and broil. 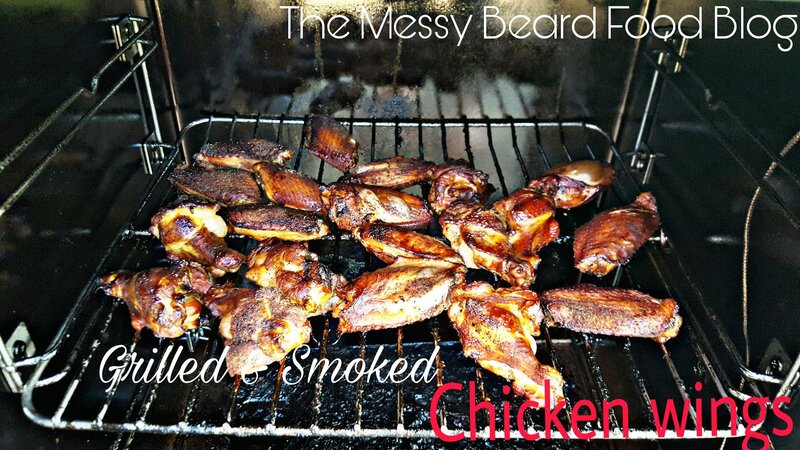 These are some of my favorite wings and I wanted to recreate a similar experience at home. Now I love fried food, it’s so bad that if I owned a fryer, I would most likely be a large tub of lard or reak of oil. Fryers are nice, but upkeep and cost for a decent one are big factors. Plus, grill marks trump grease stains any day. So for these wings I used a mixed pack of legs and wings which I found at Target. I have also done chicken legs, they’re my favorite cut from the chicken. To be honest, as long as it reaches 165 degrees in temperature it doesn’t matter what cut you use. I seasoned them in a blend of salt, pepper, and garlic to enhance the flavors of the chicken. For this dish, I like to use my Masterbuilt electric smoker. If you aren’t familiar with this brand, you need to become familiar with them. I enjoy this smoker. It holds temperature and comes with time and temp controls to help regulate the cook. Additionally, it has a meat probe built in that’s accurate, and a port for wood chips. So you never have to open it unless you’re adding water. When I am smoking chicken, I like to use apple wood. Apple wood gives the meat a sweet, soft, smoked taste. Compared to hickory or mesquite wood, which can give the chicken more of a rough or bold taste. I like to smoke the chicken between 225 and 275 degrees, for two to three hours. While you wait you can make my favorite barbecue sauce, or take the time to prep your grill for the wings. Depending on what type of grill you’re using, gas or charcoal, changes when you need to start. It takes about five minutes to heat up gas and about 20 to 30 minutes for charcoal. Once the chicken reaches 165 degrees, and your grill is at a medium to medium high… It’s time to get saucy. For wings I like a sweet heat style of sauce that will create a glaze. I always use to use store bought sauces until I discovered my Black Gold sauce. Other good choices are Stubb’s or Sweet Baby Rays, or your sauce of choice. Back to the chicken! You want to place them on the grill and brush on the sauce. Give it about five minutes then flip and repeat. With all the sugars in the sauce it will char and crust over. Congratulations! Now you have created wings that will create fireworks in your mouth and excitement in your belly. Preheat smoker to 250 to 275 degrees. While smoker is heating up, season the wings in the salt, pepper, and garlic mixture. Place the wings on the smoker and let them go. Be sure to manage the fire and smoke as it cooks. Heat grill to about 400 degrees. If using charcoal, get the coals white and glowing. Once chicken reaches 165 degrees, transfer them to the grill and coat top side of the chicken with sauce. Wait 3 to 5 minutes and flip. Pull chicken from the grill and rest for 5 minutes before serving. I serve these with fries, coleslaw, and/or macaroni salad. If you do not have a smoker you can use your grill instead! For gas, either use a wood chip box, or take water soaked chips and wrap them in foil and place under grate over the burner. (You may need a couple loads of these.) Also, for low and slow use one burner and low to infuse smoke flavor. For charcoal, create a ring around the edge of the grill with the charcoal. Place water soaked chips over charcoal and light one end of the charcoal. Place chicken in the middle and let them go, to glaze just place chicken over the hot coals. Cook them in the oven as well!! On a cookie sheet with a rack. 400 degrees for 40 to 50 minutes. Remove the chicken and brush with sauce. Put it under the broiler for 2 to 3 minutes per side. Only downfall is you lose the smoke flavor.